Despite the praise heaped on A GUY CALLED GERALD'S hypnotic first single, 'Voodoo Ray', nothing much seemed to happen. Then the single hit the clubs Stateside and Gerald was the hottest name in town. PAOLO HEWITT found the star struck Gerald in New York. PIC: DEREK RIDGERS. Tensions were already running high the day Gerald stepped out of a plane and onto the tarmac of the JFK airport in New York for the very first time in his life. At the behest of Mark Kamins, a DJ and recording artist, two DJs from the Hacienda club in Manchester had been invited over to play for two nights at Mars, one of New York's more vibrant clubs. The idea was to introduce New Yorkers to current British club culture. Graeme Park and Mike Pickering were the logical choice for such a task. They play the Hacienda on Friday nights and have turned it into the club's most popular night. On top of that they are old friends of Kamins. Meanwhile Gerald, a fellow Mancunian, who had caused such a stir in Britain with his debut single, 'Voodoo Ray', was starting to enjoy similar success with the record in New York. Subsequently Mars had agreed to a PA but insisted that Gerald would have to perform for nothing. "He's got the hottest record in town and he's playing for nothing?" Maclaren openly asked his staff, strong disbelief in his voice. Everyone present made hectic noises except for Gerald who had just arrived with his manager. He just shrugged his shoulders and grinned. He was happy enough just seeing New York for the first time. The night before Maclaren had hired a limousine and taken the awe-struck musician around the clubs. Gerald had been introduced to people whose work he admired, fallen in with some girls and taped their conversations for possible use on future releases, and generally luxuriated in the happy daze that all first time visitors to New York are prone to. "You should tell everyone," Gerald said with a heavy sarcastic tone, "that I hate it here, I really do, and can't wait to get back to Manchester." 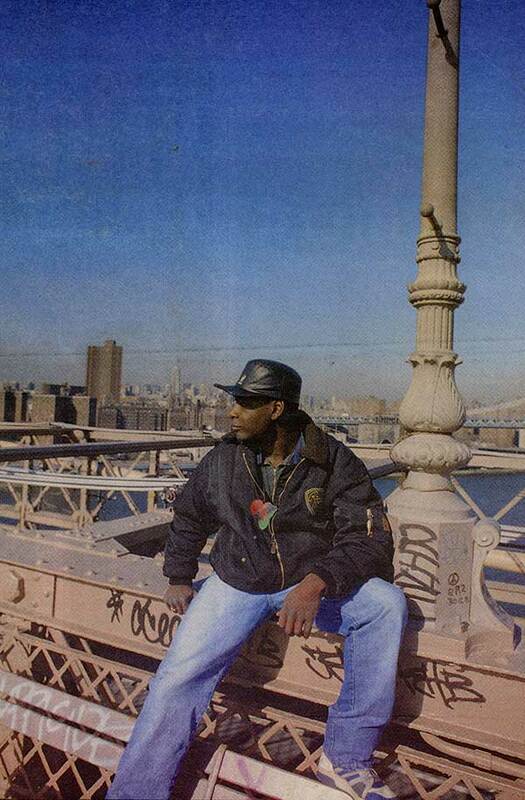 For Gerald, New York was a lifeline that could not have been thrown to him at a better time. Not only did its tremendous buildings, hectic pace, the sense that anything can happen at any time and the open attitude of its inhabitants inspire in him a true sense of having discovered his ideal environment, it also dragged him away from the problems he had been dealing with in Manchester. These were problems that began the day Gerald submitted some homemade tapes to Spin In, his local record shop. By chance, a Radio Picadilly DJ, Stu Allen, heard them and asked for a copy. He played the tape on his show and within a few weeks Gerald was signed to Rham Records, a new Manchester independent label. One of his first projects was with another Manchester group, 808 State. According to Gerald he helped them out with bass lines and drum programmes on the debut LP 'New Build'. "I think I've still got a list at home," he says regretfully. "I was going to do a record with Spin In, I was going to do two records with Rham and three with 808 State. The reason I was going to do that was to try and get money to do something of my own. But I found out that people don't want you to do what you want to do. They only want you to do what they want because it's their money." After his work with 808 State, Gerald then started work on his own project. Working with the same equipment that DJ Pierre used when he cut the first Acid House record, Gerald finished his LP in time and under budget. Then Warner Brothers called him up. "They said," he claims, "we're going to take everything off you, don't sell it to anyone else, we want it all, hang onto it. I thought, well, fair enough, they're one of the biggest record companies in the world. A couple of weeks later they said, 'our American people don't like it', and that was it. We were stuck with 2000 records that should have been released earlier." The worst was still to come. The record that had alerted Warners to Gerald's talent was the single, 'Voodoo Ray', a hypnotic, individual track that had received great acclaim on its release, and had become as much a club favourite as 'Big Fun' or Todd Terry. Yet it was proving increasingly hard to buy a copy. The reason for this was simple. Red Rhino, the distributors of the record, had gone bust and in the ensuing chaos blocked the single. All the money Gerald thought he had coming his way was now vapourising into thin air. "I was working with 808 State," Gerald recalls, "and at the time I was signing on. They stopped giving me giros so I had to go and ask the group for some money. They gave me £1000 for the 'New Build' LP but I haven't seen anything for 'Let Yourself Go' or 'Massagerama' which is another track they've got out under the name of The Lounge Jays. Plus there's two new tracks on the new LP that I've done and I don't think I'll see anything from them. If I do it will be in bits and pieces. "I think they've got a grudge against me. When one of them found out that Red Rhino had gone bust and I wasn't going to get any money they were laughing in my face. Fair enough. We'll see who has the last laugh." Which is 99 per cent of the reason that Gerald is prepared to fly 3000 miles to play a show for nothing. Anything to get out of the depressing no-win situation back home. "It's like at the moment I don't want to go home because it's all a mess," he sighs. "What I'd like to do is start afresh here. I was talking to Al Maclaren and over here they'll play you tapes and say, 'what do you think I should do with this?' They're asking my opinion and giving me respect. I like that. But with people I work with in Britain, it's do that and then shove off. They want all the credit for it. I don't mind that but I want to enjoy what I'm doing." T he British have been selling American music to America since time immemorial. Berry Gordy sent over Motown music, which The Beatles adapted and conquered America with. In 1986, DJ Pierre cut 'Acid Trax' under the name Phuture and three years later, with an Acid influenced LP under his arm, Gerald is performing in New York. Actually, New York has stayed resistant to Acid. "There were no power centres for that kind of music," explains Brian Chin, A&R man at Profile Records. A thoughtful and long time observer of both the New York and London club scene, he believes that Acid House's failure to cut it in its own country is down to a number of reasons. 'If you. were here in December and. January," he says, "you would have heard only two House records on the radio. 'Break For Love' and 'Big Fun' and that was it. The rest of America always wanted something that was funkier. That's why Bobby Brown is very much a non-New York record although it turned out to be the Number One record of the year, but it was very unlike New York music." The structure of American radio, where stations have to compete for advertising, means that station controllers always target the music to the all important 24-35 crowd. This means their choice is safe and conservative. It explains why Rap has such a hard time getting airplay. It appeals to a much younger crowd that the advertisers are not interested in. Also, the New York club scene has been going through a state of flux. DJs move around a lot from one club to another so a natural base for any kind of music is never established. Whereas in Britain DJs tend to stay at one place. "DJs here," says Chin, "are a lot more like jukeboxes, they're really afraid to clear the floor and the entire idea of club going is not such a devotee thing as it is in Britain. And that's a shame." America has always loathed categories. To label a record is to limit it to one section of the population. It means failing to 'crossover' and a big drop in sales. Gerald agrees with this attitude. He doesn't see himself as taking coals to Newcastle. He insists that his musical development occurred in tangent with the House explosion of last year, that both reached the same conclusion at roughly the same time. "I reckon if I was trying to be more American," he states, "I'd think that it was funny me coming here to play. But I'm doing my own thing and people like me as me. If it does sound like Acid it's only because I was using the same equipment as DJ Pierre and he was the person who said, 'my record is called Acid'." If he had been given the choice of equipment, would he have still made the same LP? "No, it would have been a lot more abstract. Anything I do now, it's going to be a lot more about sounds. I've got hold of a sampler now and I'm going wild. I'm walking round with a tape recorder taping all sorts and collecting things. "With this LP the songs are not as structured as they should have been but to me it's like a sketchpad; it's something that shows different parts of what I can do, I've got different abilities to do different things." Of his British competitors, Gerald can only cite Baby Ford with any credit. The rest, he believes, are making music with calculators, and not their hearts. Despite all his difficulties, he's still keen to help new groups. He believes Manchester is flowing with talent that only small labels such as Rham are equipped to pick up. "Some of the people I've worked with," he says, "say I don't want to do this anymore, we're going to do this type of music now". They expect me to change what I'm doing to what they want because it's selling. But 1 can't do that. I just do what I feel really. "It's a waste of time saying let's use this Kid'N'Play beat because it's going to sell. When I did 'Voodoo Ray', I did it because I felt like doing it. I didn't do it because I thought if I have this girl singing over it that's going to sell. Personally, as long as I get respect that's the most important thing to me." And in New York, that hustler's playground, where life is stretched to every extreme possible, Gerald is getting respect. 'Voodoo Ray', that wondrous single, has already solo over 20,000 copies in a week. Frankie Knuckles, no less, performed the remix surgery, and people ask Gerald his opinion on music. It may well be that Manchester's pride is now New York's gain.